Whatever happened to the family friendly blockbuster? About to hit cinemas are what are sure to be 2 huge blockbusters; Passengers and Rogue One: A Star Wars Story, what is unsurprising is both will most likely be rated 12a, meaning anyone can see them, but under 12’s need an adult with them. When I saw the first Star Wars in 1977 it was a U, as I grew up we had so many family films:The Goonies; Back to The Future; War Games; Who Framed Roger Rabbit; Short Circuit; Cocoon; Krull; Legend; Willow; Beastmaster to name but a few. Then Gremlins came along, not suitable for a PG it was rated 15, uproar then followed and kept building until Tim Burton gave us Batman 5 years later, lessons were learned and the 12 certificate was born. But that wasn’t enough, as demand for these films wanted under 12’s to see them, so in 2002 the 12a was created to give more decisions to the consumer and allowed under 12’s in with adult supervision. The 12 certificate however now covers everything it appears. All the comic book films as well as the franchises I grew up with, Indiana Jones growing up had PG adventures but his search for the Kingdom of the Crystal Skull was now 12 rating. Steven Spielberg‘s Jurassic Park was a PG the Jurassic World a 12 and it goes on! Star Wars has always been U until the prequel’s Episode II: Attack of the Clones, it was now PG but then from Episode III Revenge of the Sith onwards its been 12 rated. Ghostbusters in the Eighties was a PG now in 2016 it’s a 12. Are we more easily offended or are we just not wanting PG family friendly fare anymore. With the exception of The BFG nearly all the blockbuster releases this year were 12 rated; Warcraft; X-Men: Apocalypse; Independence Day: Resurgence; Star Trek Beyond; The Legend of Tarzan even Zootropolis. Of course it doesn’t stop there! Not only are the PG films being rated 12, those horror films that were 18 are now 15/12 to maximize audiences. The action hero of the Eighties with all the violence is now watered down, we had Cobra, Commando and Robocop with 18 certificates but now greed for box office takings has taken over, Liam Neeson may have been relentless in the first Taken film but by the end of the franchise he was about as menacing as a parking attendant as they got more and more watered down, as did the new Robocop! Violence was deemed a box office turn off! Even films aimed at the nostalgia market, The Expendables did well at first, but when they watered that down to the 12 certificate audience, they lost their audience and the Expendables 3 bombed badly! John Wick and Deadpool both avoided the 12 certificate and are better films for it, will the franchise stay for adults as they take more money? Time will tell. Of course, studios don’t make films for our enjoyment first, they make them to make money so if the 12 with its comic book violence brings in money, well it’s understandable. I would have said Hugh Jackman’s Real Steel felt like a PG film from my era but for some mild bad language and a scene where a man is beaten up, pushed it to a 12, but hey Raiders of the Lost Ark had melting faces! Monster Trucks opens soon and with its comic feel of man with a truck that is a pet monster sounds great family fun and is indeed rated PG but it is already expected to be a massive box office flop. Jumanji was a PG with Robin Williams but I will be shocked if The Rock version follows. So are we missing out on the next Goonies or Back to the Future? It’s unlikely but the 12 certificate has got a lot to answer for, if it didn’t exist, we would get less watered down action films and maybe our comic book bad guys will be less menacing! 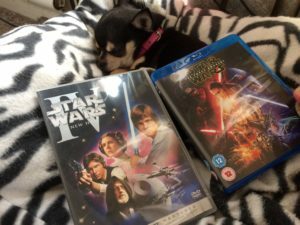 Pepper dreams of more PG friendly films as now even franchises that were suitable for all the family but are now 12 rated!